Iron is melted here. 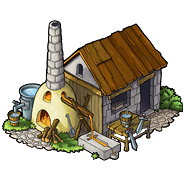 Based on its level your iron foundry can increase your iron production by up to 25 percent. The percentage added to your production is based on the gross production of your iron mines. This means the production of your fields without any bonuses. The level dependent attributes ((such as construction costs, generated culture points and overall iron production increase) can be found here.